Around age 4, the scribbles that represent writing start to take on the shape of actual letters. 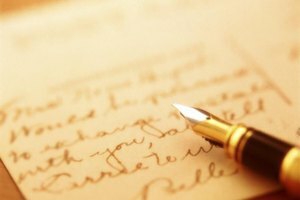 Writing seems easy to adults, but young kids struggle to coordinate the mental component with the physical act of producing letters. An age-appropriate approach that builds on the child's skills helps her master letters as an emergent writer. Before a child can write letters, he needs letter awareness and the physical ability to use a pencil. 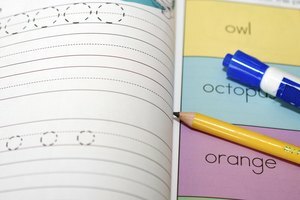 Handwriting expert and pediatric occupational therapist Lauren Stern recommends reading frequently with your child and pointing out letters in the environment to build letter knowledge. Build hand strength by letting him scribble away with crayons, markers and sidewalk chalk. He also builds his hand muscles by cutting with scissors and squeezing clay. Picking up small objects, such as blocks or toy cars, helps with the manipulation skills. Learning to form letters correctly starts with proper positioning. Practice letters with your child sitting at a table. She should be able to sit comfortably at the table with her elbows resting on it. She also needs a proper grip on the pencils. Help her position the pencil between her thumb and pointer finger, with the side of the middle finger used as support. You're building her handwriting habits now, so don't let her get away with sloppy or improper pencil holds that make it more difficult to write. Learning to write letters doesn't just have to happen with pencil and paper. Incorporate different sensory activities to make letter-writing engaging and enjoyable. Let your child form the letters from clay. To reinforce the proper way to write letters, show him how to place the clay on the table starting at the top just as he would begin with the pencil at the top of the paper. Another option is to spread shaving cream on a pan or counter. Let your child write the letters with his finger in the cream. 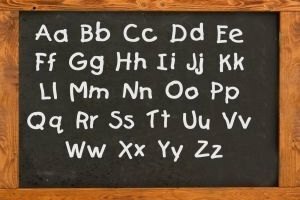 You don't have to teach the letters in alphabetical order. Starting with the letters in the child's name gives writing a personal connection. The child may already know the letters that make up her name. Now it's time for her to go from saying the letters in her name to writing them. Print her name so that she sees how it looks. Write the letters again one at a time so that she can copy you. The nationally known program Handwriting Without Tears starts with all capital letters, which are usually easier to identify and write. When a child masters upper-case letters, teach her the lower-case way to write her name. Your child might also show interest in writing letters to form other meaningful words, such as family members' names. Continue expanding and working on other letters until your child learns the entire alphabet. 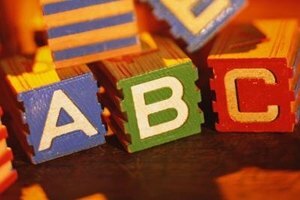 You might choose a few letters to focus on each week, or work on letters as you see them in the environment until your child knows how to write all of the ABCs. Practice the letters you see on a street sign on a walk, for example. Handwriting Without Tears: This Is My NAME! Frost, Shelley. "How to Teach Children to Write Their Letters." Synonym, https://classroom.synonym.com/teach-children-write-letters-4914074.html. Accessed 25 April 2019.